We’ve been adding new features and capabilities at a brisk pace since we first introduced the form creator in 2016. 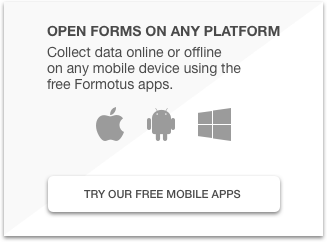 Formotus has been available commercially for almost a decade now, offering companies a no-code way to deploy enterprise-grade forms and mobile apps. The Formotus portal and mobile apps have been production-hardened for years. What’s new is our browser-based online form creator. Prior to last year, all customer forms were built using Microsoft InfoPath. We will continue to support InfoPath forms, but now we also offer this exciting post-InfoPath alternative. 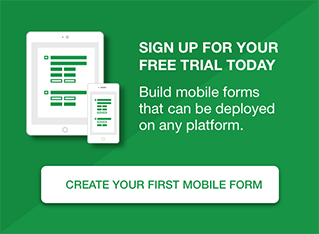 Customers who use Salesforce can now access that data as a source inside their Formotus forms. The data connection can include a query with parameters so that it returns only the necessary subset of records. This can prevent overloading mobile devices with excess data. Once the query is completed online, the retrieved data is cached on the device and remains available to the mobile user offline. Customers who work in the Google environment can now submit their data to Google Sheets and the PDF version of their forms to Google Drive. Fields in the form can be promoted to become columns in the Sheets, and each row links to the PDF version of that form submission. This is also a good option for those who don’t yet have back-end storage for their forms, because a free Google account is all that’s needed. We often see a customer requirement to capture a large number of high-quality photos in a form. The challenge is that forms become too large for the resources of the mobile device. That’s why we created the Repeating Photo control. High-res photos are saved as files to a location such as Google Drive or a SharePoint library. Only smaller thumbnails are saved in the form, along with links to access the full-size pictures. Many advanced options are available (see screenshot). Sometimes you don’t know how many items to expect in a form. How many rooms will be inspected? How many lines invoiced? How many signatures collected? That’s when you need our new repeating section control. A repeating section is a control that contains a group of other controls, almost like a form within a form. The user then adds as many new instances of that group of controls as needed in the situation. Retaining PDF file ‘snapshots’ of submitted forms can be important for keeping a record — complete with photos and signatures — that can be viewed or printed later by anyone with access to the files. The Formotus creator now lets you design forms that submit PDF by email, to Google Drive, or (coming soon) to SharePoint libraries. The PDF to be submitted can be customized in the creator. For example, you can remove visible buttons and input controls, and you can choose to include only a subset of the form’s total content in the PDF.